TEHRAN For 27 years, Iran's Islamic regime has faced an uphill battle to cleanse the country of bootleg liquor. But even after a recent law increased the punishment for drinking to 74 lashes, a hefty fine and imprisonment of three months to a year, drinking is widespread. One seller, who calls himself Allan, says business is so good that it is even worth the fine and the flogging. "I tell myself that the fine does not even come to the tax that I should be paying," he said. "The demand is high and the income is excellent. It is hard to quit." Every month, newspapers report the confiscations of tens of thousands of bottles of bootleg liquor. The Mehr news agency last month quoted a senior security official, General Hooshang Hosseini, as saying that the amount of liquor in Iran was increasingly alarming. Despite the constant crackdown, there is no sense of shortage. With one phone call, one can get anything from French wine to Russian vodka and homemade Armenian vodka. One Armenian delivers the goods on a scooter; he wraps them in black plastic bags and hides them in a saddlebag. Allan puts them in the trunk of his car. Before the revolution of 1979, about a dozen Iranian factories produced beer, vodka and wine. The Iranian grape is so good for making spicy wine that the Australian shiraz, better known as syrah elsewhere, is made from the same grape that grows in Iran's southern city of Shiraz. In fact, the Islamic regime is caught in a bewildering situation. Islam forbids the use of alcohol, and the Koran explicitly calls intoxicants "the abominations of Satan's handiwork" that want to turn people away from God. But drinking and wine are integral to Persian culture. 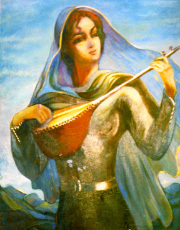 Mey, the word for wine, and Saghi, the wine pourer, have been central motifs of Persian poetry for well over a thousand years. Most poems by Iran's 14th-century popular poet, Shamsudin Mohammad Hafiz, who was Shiraz, revolve around wine. A rose without the glow of a lover bears no joy; without wine to drink, he wrote, the spring brings no joy. Wine's discovery in old Persia predates French wine. The earliest evidence of winemaking dates from 5400 B.C., in the Haji Firuz Hills, near western Azerbaijan Province, south of where the city of Orumieh is today. "The French are in fact jealous about that because the earliest evidence in France goes back to 500 B.C.," says a French archeologist, Remy Boucharlat, who works in the archaeological sites in Iran. After the election of the reformist President Mohammad Khatami in 1997, the government allowed drugstores to freely sell a pure alcohol. Until then only doctors were permitted to get a limited number of bottles for medical use. Since then, more than 40 factories, some of which have imported machinery from China and Europe, are competing in the market. A 600-milliliter thin plastic bottle, known as pocket-size here, with little indication of medical use, costs less than $3. The common recipe is to mix a shot of alcohol with two shots of juice, preferably pineapple. One factory, which produced beer and wine before the revolution, was producing 20,000 bottles of alcohol a day until the government forced it to add Bitrex, a substance that made the alcohol too bitter to drink. Its sales have dropped to 3,000 bottles a day. Other factories that do not comply with the rule have replaced their competitor in the market. Owners of the factory complain that the law has not been enforced on these other producers. One senior official, who spoke on condition of anonymity for fear of retribution, said the decision to permit such widespread production of alcohol was made to limit the number of deaths and casualties caused by illegal drinking. About 19 people died in 2004 after drinking bootleg liquor. The government also worries that if there is not safe liquor, dangerous hard drugs will take their place. "A lot of people had turned to drugs such as opium because they were cheaper and more accessible," said the official. Different kinds of liquor are now smuggled into the country from the Kurdish areas of Iraq. Various flavors of Absolut cost $21 a bottle and Baileys costs $43. Allan, the liquor seller, was arrested once during the student demonstrations of 2003 while he was on his way home from a delivery. The police thought he was among the pro-democracy protesters. He spent a month in jail and was beaten every day until the police searched his house and found his basement full of liquor. "From then on, it took me a day to get out," he said. "The judge asked me if they were for my personal use, and I said yes. He fined me 1.2 million rials" - about $1,300 - and gave a one-month sentence, he said, adding that he was allowed to buy out his prison term for $3 a day. Business is so good, Allan said, that he selects his customers. "I try to avoid the alcoholics because they have no patience and they drive me crazy," he said, as his mobile phone interrupted every few minutes and he jotted down long lists for delivery. The only time that business is slow is during the Muslim mourning month of Muharram, Allan said. His customers, more than a hundred of them, are reduced to just a few. The rest of the year he works up to 18 hours a day. "The only problem with the job is that it is hard to get married," he said. "Families are reluctant to let their daughters marry someone who can get arrested any day."